Over the past two years of traveling, I’ve lost all faith in “accidentally” finding great places to eat. Those serendipitous encounters with lesser known local culinary gems are rare and blindly searching for one typically ends in a rushed and disappointing meal at a fast food chain. Generally, my lack of free time demands restaurant research in advance for almost every new city I visit, however, today I randomly wandered by an awesome place – Cyber Dogs Internet Café. It’s rather humble and unassuming from the outside. 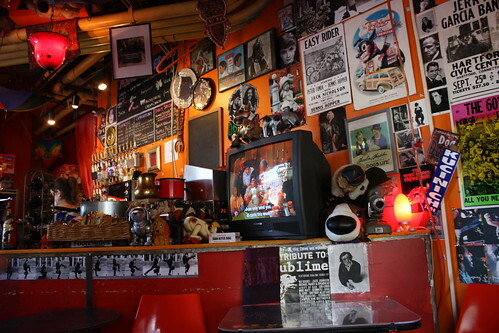 A runner or brisk walker might never discover the funky interior décor and delicious food! It’s a tiny place; there are a variety of typical caffeinated and alcoholic beverages. I’m sure this is a great place to stop in after a night of bar hopping in Capitol Hill, but it was completely empty when I dropped by, and it was a cozy escape from the bustling streets on the nicest day Seattle has seen in weeks (so I was told). 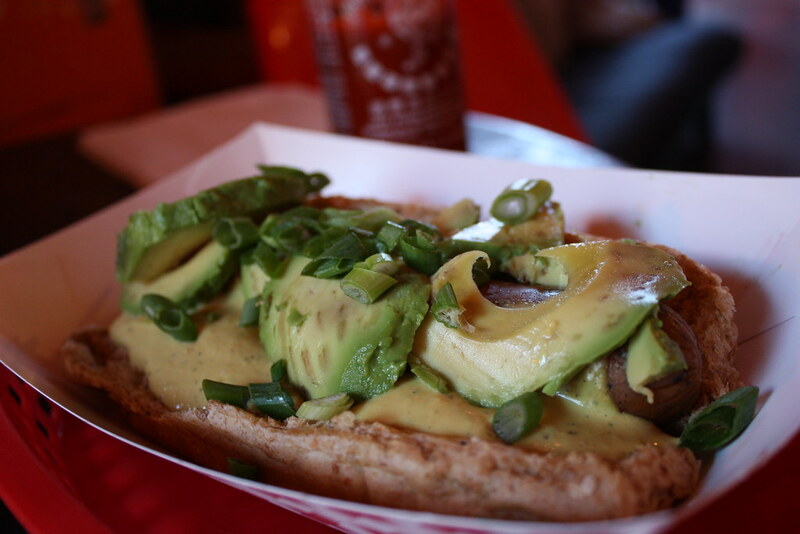 Vegan bratwurst, vegan melted cheese, thick slices of fresh cut avocado, sprinkled with green onion on a whole wheat bun. The barista suggested that I add Sriracha and seriously, what doesn’t Sriracha make better?! This masterpiece was only $6. I slipped into a temporary and blissful food coma while Portishead sang sweetly over the speakers. How cool is that? Not pictured: Kate licking the cardboard carton clean when the barista stepped into the backroom. Seriously. *I seriously might stop back by this place tonight. This entry was posted in Seattle, Vegan and tagged Coffee Shops, Seattle, Vegan. Bookmark the permalink.